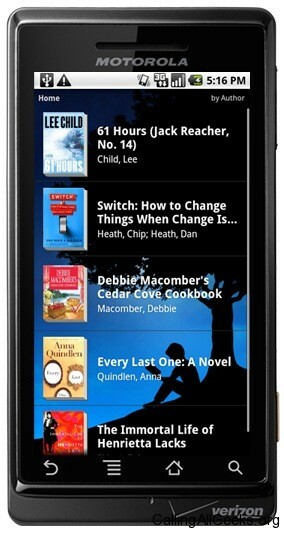 There are different kinds of reading apps on the Droid, from actual book apps to recommendation apps. All of the apps below can be reached on androlib and can be easily installed by using Barcode Scanner to scan the QR code on the page. Aldiko Book Reader – Read and download thousands of books right on your Android phone. Android Book Club (ABC) – An app to help you find new books to read based on searches, ratings and more. Books WordPlayer – A Calibre compatible ebook reader that can also download ebooks. The developers also have plenty of stand alone ebooks apps. eBooks by Kobo – Access to millions of popular titles and free books in the Kobo store for your Droid, Droid 2 and Droid X.
FBReader – A ebook reader that supports epub, oeb and fb2(.zip) file formats. Download books or install them directly on your SD Card. Google Book Client – Helps you search for and read books with Google books. iReader – A book reader with search and auto-scroll functions for reading your ebooks. Kindle – This Amazon reader will allow you to buy from their ebook store and sync with the iPhone/iPad or Kindle reader with WhisperNet. Laputa Book Reader – Guttenberg and Manybook supported ibook ereader. nook – The Barnes and Noble book app will allow you to purchase digital books from the BN.com store and share them with fellow nook owners. Twilight – The Stephanie Meyer penned sparkly vampire book is available in this app for free if you don’t want to purchase it for your Kindle or nook apps. Wordoholic Reader – Read .epub, ..fb2 and .txt files with this ebook reader that purports to help learn foreign languages. As a voracious reader, I love to always have things to read with me. As such, it’s great to have books available on my Droid, which is always with me.